The Cuban health care system has a very good reputation and is much more advanced than most other countries in Latin America; it often serves as a model for developing nations around the world. Although some medicine or equipment are not always available, Cuban doctors are highly qualified and the care and treatments are comparable, and sometimes even better, than the ones received in more developed and wealthier countries. Cuba operates a special division or clinics and hospitals specifically for the foreigners and diplomats, with English-speaking doctors and better supplies and equipment. There's one of these clinics in Cayo Santa Maria, see location here. The cost for a consultation or treatment is very low compare to a private clinic in North-America or Europe. In recent years, "Medical Tourism" greatly increased in popularity; several thousands of "Health Tourists" travel to Cuba each year. 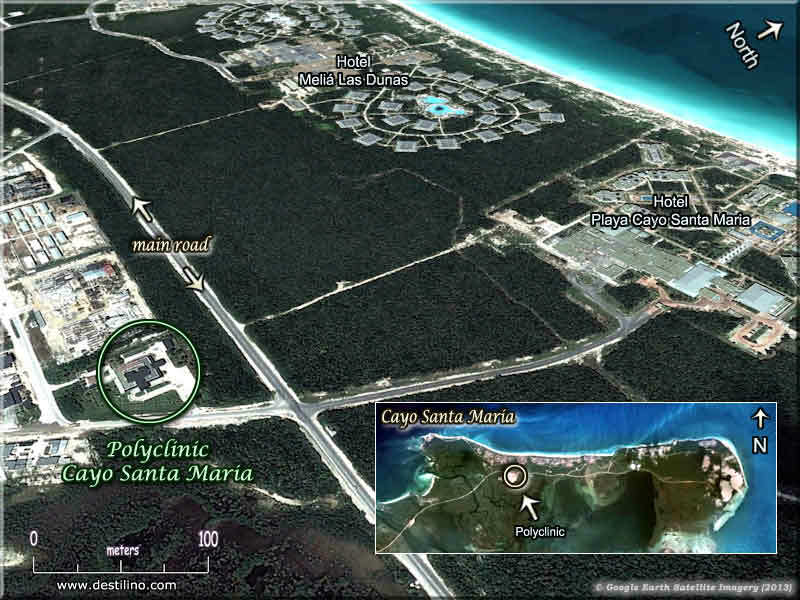 In Cayo Santa Maria there's no doctor office inside the hotels, all medical services are now centralized and provided by the Clinica Internacional Cayo santa Maria which is within 10 to 15 minutes drive from any hotel, and they have doctors on-call 24/7. If you need to see a doctor for an emergency, you can either call your hotel's front desk and a doctor will come directly to your room, or, you can call the clinic directly (see contact information below). Ambulance service is available for emergency, or you can take a taxi to get to the clinic. Click to see the Clinic's Brochure (pdf). Note that health services are never part of your All-Inclusive package. However, you'll be surprised to see how low prices are! If you need to see a doctor, make sure also to contact the travel-assistance service of your insurance company as soon as possible to advise them of the situation, even if it's a minor illness or small injury. Since May 1st 2010, all foreigners who want to travel to Cuba must be covered by a travel insurance that includes a medical care benefit. Upon arrival travelers may be required to present a proof of medical coverage valid for the entire period of their stay in Cuba; in the form of an insurance policy, insurance certificate, medical assistance card, etc. If you enter Cuba without travel insurance, you will have to purchase a health insurance plan with the Cuban travelers aid company called ASISTUR S.A. (www.asistur.cu) at the point of entry; they have an office in every Cuban airport. Servimed is the Cuban organization which is specialized in medical assistance to foreigners; it’s a for-profit health-care system. They have several clinics all over Cuba, in major cities and tourist areas. It’s different from the free health care system provided to the local population. Cuba attracts about 20,000 "health tourists", generating revenues of around $40 million a year for the Cuban economy.